Do You Think Buffett Has Lost It? Some have suggested that Warren Buffett has lost it, as he trails the S&P 500 over the last 5 years. 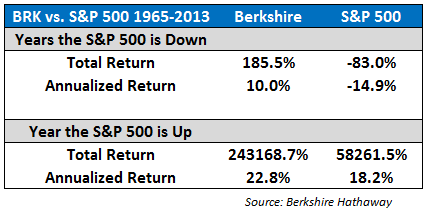 But Ben Carlson shows that historically Buffett has really outperformed during the downturns. “The best investors do not target return; they focus first on risk, and only then decide whether the projected return justifies taking each particular risk. Are You Chasing the High-Fliers? Do you own popular stocks like Twitter, Tesla and Netflix? If so, you shouldn’t expect much from your portfolio, according to Patrick O’Shaughnessy at Millenial Invest. 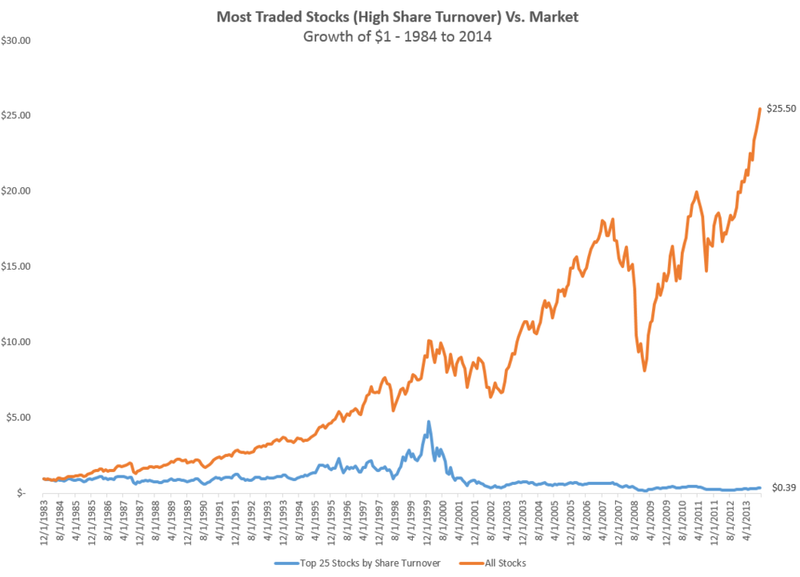 Measuring popularity by high share turnover, the most popular stocks have tended to badly underperform the market. This isn’t surprising, as their popularity makes them expensive in good times and they tend to get hit harder in downturns. As O’Shaughnessy notes, you are generally better off avoiding these stocks. As an added bonus, doing so will give your portfolio a value tilt. Do You Think You Can Identify the Big Winners in Advance? This chart from Scott Krisiloff shows the downside volatility of the biggest winning stocks over the last decade, as of summer 2013. 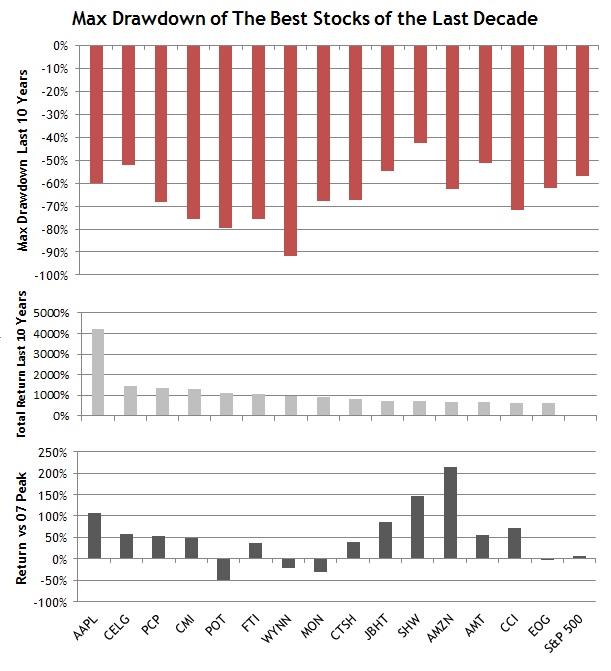 These are great returns, but would you have held on when they had drawdowns of 60% to 90%? If you are going to invest in the exciting, go-go stocks, you better have a strong stomach. And are you really sure you can identify the long-term winners in advance and discard the flameouts? Good luck with that, but this isn’t the game I play. Remember the saying defense wins championships. A la Warren Buffett, this sports truism works in investing, too. Don’t forget the math of drawdowns. The end of the market’s best six months is fast approaching — also known as “Sell in May.” Mid-term election years intensify this effect. So weakness in the next 6 months wouldn’t be at all surprising. Things are still a bit frothy and many of my watch list stocks are becoming less and less attractive for new purchases. Between not being able to find much that is cheap enough to buy and the weak seasonality, I’m updating my watch list and holding some cash so I can take advantage of any opportunities that may come my way in the next few months. Jeff Saut thinks we are in a secular bull market. If so, pullbacks are for buying. Bob Shiller thinks the odds of a recession any time soon are very low. Recessions usually end bull markets. Score one for the bulls. What If We Have a Bear Market? What happens if we have a bear market? 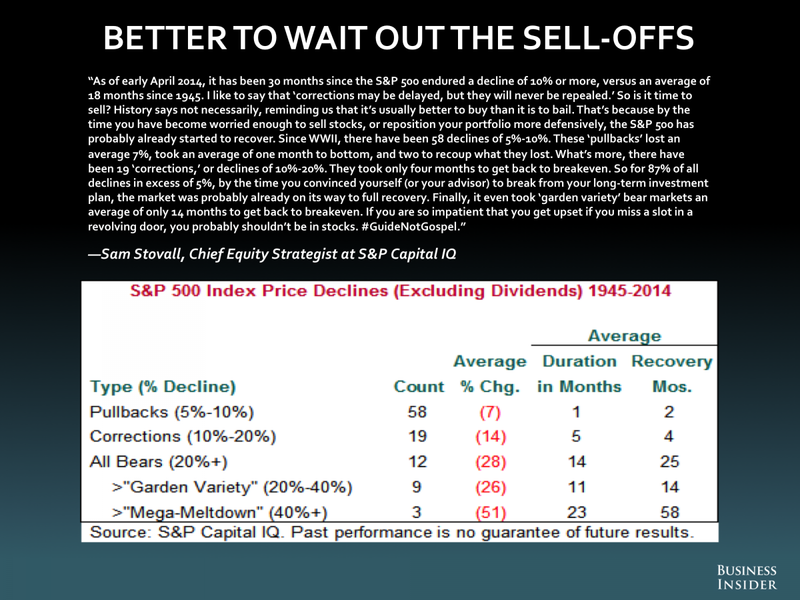 It’s usually better to wait it out, according to Sam Stovall. 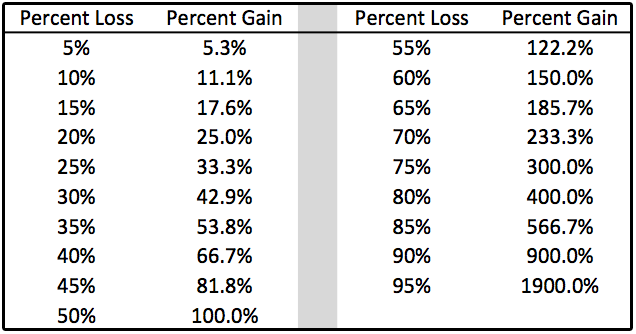 This chart shows the percentage gains needed to recover from losses of different magnitudes. Patience is the individual investor’s greatest advantage over the market.